At the end of 2013 SOS were successful in winning three awards at the Burton Chambers of Commerce Business Awards 2014 including Business of the Year. As a follow up to the Burton Awards we entered the Greater Birmingham Chambers of Commerce Awards in the Excellence in Innovation category. 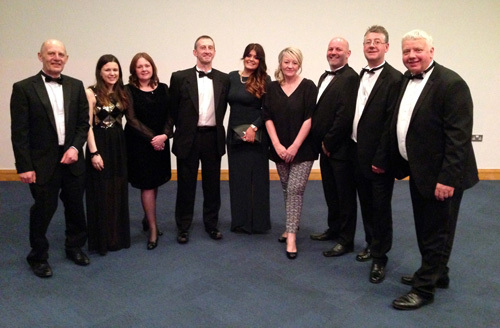 On Wednesday 16th April 2014, we were invited along with other businesses in the area to attend the dinner awards ceremony at the International Conference Centre in Birmingham. With over 700 guests in attendance from all over the area, including some other Burton On Trent businesses; the event was a great way to celebrate the achievements of the region over the last 12 months. President of the Birmingham Chambers of Commerce, Tim Pile opened the event by outlining the achievements of the greater Birmingham region. The business and economic growth in the Greater Birmingham area is second only to London and as a British manufacturer SOS is proud to be part of the economic recovery. We are pleased to announce that SOS finished a close 2nd in the ceremony, receiving the highly commended award for our continued investment in technology, innovation and growth. The Greater Birmingham Chambers cover a large geographical region. SOS impressed judges and fought off tough competition but was piped at the post by Datatecnics Ltd who won 1st place. SOS has invested significantly in new technology to improve not only the range of products we are able to offer our clients, but also improvements to efficiencies within production areas. These investments include a Robotic Welder, CNC Milling Machine, CNC Lathe, CNC Router and Foam Carving Machine (including digital scanner). This has allowed us to improve productivity and reduce lead times within the factory and also ensure we have the capability to manufacture almost all of our products in house. The technology also means we are able to offer our clients a more comprehensive range of products which further enhances are reputation as one of the leading suppliers of posture and mobility equipment in the UK. Manufacturing of special seating is an extremely labour intensive operation and the move to automation, where possible, allows us to ensure our clients receive their completed seating systems within our strict delivery lead time of 4 weeks following assessment, or in many cases much sooner. Congratulations to all of the award winners, and runners up and a big thank you to the SOS staff who made all this possible. Visit the Greater Birmingham Chambers of Commerce website for more information.